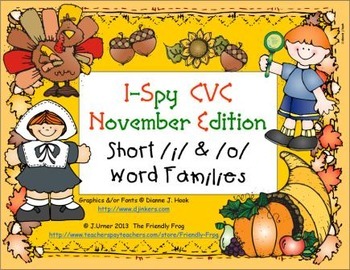 The focus of this set is on CVC words with the letter sounds /i/ and /o/ in the middle. There are two half-sheets each for the Word Families –id/-ig, -ig/-im, -it, -ip/-in, -og/-od and –ot/-op. Each of these sets have ten words for your students to find. There are also two full-size pages each for combined Word Families –id/-ig/-im, -it/-ip/-in and –og/-od/-ot/ -op (for a total of twenty words) to offer a more difficult challenge for your children. 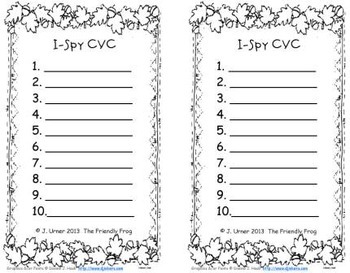 As a bonus, you will find four half-sheets and two full-size pages with assorted CVC /i/ and /o/ words.General instructions: Use a magnifying glass to find the hidden words in the picture. Write the words down as you find them. Read them to the teacher or a friend when your paper is full. Game Version. Scallop glitter borders with a single tiny word ON each picture.